In the past 10 or so years, we have seen the Internet world go from barely there, to everywhere. Years of ‘Trial and error’ in Social Media Marketing and/or Digital Advertising have brought us to the point where they have become the number one form of promoting people, products, services, and pretty much anything else you can think of. In 2010, there were many new technologies in the social media sector. To name and talk about them all would take all day, and probably thousands of pages, and maybe even a Hollywood blockbuster (think The Social Network). 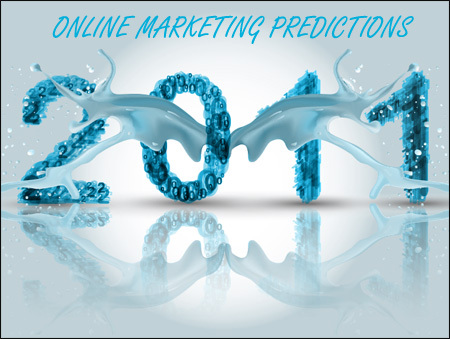 Hence, a few of them will be honorably mentioned below, finishing up with some of the most popular predictions for Online Marketing in 2011.
Who didn’t catch a glimpse of the arguably brilliant Old spice campaign on YouTube this past year? The “Smell like a man, man” campaign became an instant hit. More than 180 hilarious ads were shot purely in response to consumers’ inquiries. Very clever campaign indeed. As for the tweeters out there, you may have noticed something new on Twitter called Promoted Tweets. Twitter took a thing or two from Google here, promoting sponsored terms, along with organic results, whenever a user searched for any term on the site. Organizations such as Coca-Cola and Virgin America claimed to have seen obvious increase in campaign engagement rates as well as sales rates due to those promoted tweets. Everyone has now heard of Chatroulette, the random video chatting website, which allows you to chat with anyone, anywhere, anytime. Other than obvious perverts takings advantage of it, Travelocity added a nice touch in their advertising on this site. They added their little Gnome character that would appear in chat rooms holding signs saying this like “This would be more fun in Rio”. The idea was to promote travel for those sitting down chatting their lives away. The next year to come holds a few interesting predictions for digital advertising. Let’s have a small look at three of those predictions. To start with, local advertising will become relevant again with location. Facebook is expanding this technology with its new location platform, Places. There is a growing use of location platforms such as Foursquare, Yelp, Shopkick, and Google. Advertisers will start using these to alert shoppers of certain deals or sales when informing others of their whereabouts etc… This seems really exciting for the new coming year! In addition, influencers will be the stars of the social web. Digital advertisers are always on the lookout for new trends, and new ideas for pushing their brands and services out there. Consumers are always online checking out where to go, what to buy and where to buy it, so it is only natural that brands are always seeking the next big thing in reaching out to their consumer base. Finding ways to be socially credible is a must for brands wanting to market themselves online to already established customers, or new ones. Finally, although it is not yet clear exactly how and why Facebook ‘Likes’ are important, but one thing is for sure, they definitely are. Brands will be using facebook advertising much more in the coming year, and being savvy enough to know how to use it to gather more ‘likes’ for the best possible CPA (cost per acquisition) may be the make or break it point for your brand. All that being said, feel free to share you’re ideas and opinions on these new technologies. What will you be doing to increase your brand awareness this coming year?